A CDC technician shows another bacteria's resistance to a powerful antibiotic. "The medicine cabinet is empty for some patients," CDC Director Dr. Thomas Frieden warned Thursday. A 49-year-old Pennsylvania woman tested positive last month in her urine for a strain of E. coli bacteria containing a mutated gene known as MCR-1 that is resistant to colistin, one of several antibiotics used against gram-negative infections, which are multidrug-resistant and difficult to treat. Though the case marks the first known appearance of a pathogen with the MCR-1 gene in the U.S., such bacteria strains have been appearing for years in other parts of the world. An analysis conducted in January by the Natural Resources Defense Council identified at least 18 countries that reported pathogens with the colistin-resistant gene, the majority of which were found in livestock and meat being sold in markets. And a study published last November in the Lancet found evidence of MCR-1 in food animals and humans in China, raising the possibility it was transferred to people through livestock. Colistin resistance has been detected before, but the discovery in China was of particular concern to researchers because the mutated gene was located on a plasmid, which are circular DNA molecules that can transfer genetic material to another strain of a similar pathogen or to a different pathogen altogether. 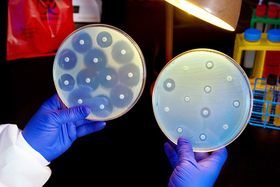 If such a transfer were to occur within a pathogen that is already resistant to other last-resort antibiotics, it raises the risk that a pathogen that is resistant to all known antibiotics could develop. Health officials have been sounding the alarm for years about superbugs, which have been on the rise over the past two decades because of the overuse of existing antibiotics in healthcare and in animals for food production. Recent estimates by the CDC indicate one in three antibiotics prescribed in the U.S. are medically unnecessary for the conditions they are meant to treat. Compounding the problem has been a dearth in the development of new antibiotics able to combat these anti-resistant pathogens. As of May an estimated 37 new antibiotics were in clinical development, according to the Pew Charitable Trusts, with 13 in Phase 3 clinical trials. Historically, only one in five products that reach Phase 3 win approval.